The Montgomery County Planning Board, part of The Maryland-National Capital Park and Planning Commission, maintains a digital interactive map of county highways and transitways to provide information to the public and allow continuous public feedback on the adopted Master Plan of Highways and Transitways (MPOHT). Click the link HERE or the image below to access the tool. This tool, called the MPOHT Feedback Map, allows users to view the Master Plan of Highways and Transitways and associated information from the adopted functional master plan. Users can leave their online comments, which will be checked periodically by staff. 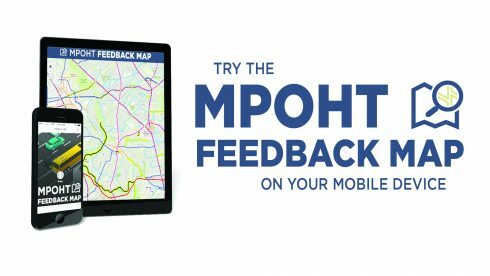 Subsequent to the adoption of the 2018 Technical Update to the Master Plan of Highways and Transitways, the MPOHT Feedback Map has been re-activated for reference and ongoing public comment. Updates to the MPOHT Feedback Map will be made periodically as master plans around the county are approved and adopted by the Montgomery County Council. This master plan is updated on a regular basis when area and sector master plans are prepared. The intent is to keep this interactive map current representing the adopted highway and transitway network within Montgomery County at all times.